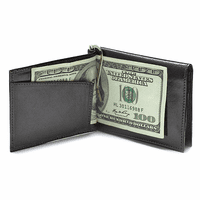 Besides just making you look really cool, a money clip is also a practical gift item! The slim, compact clip is lightweight and virtually imperceptible in your pants or jacket pocket! 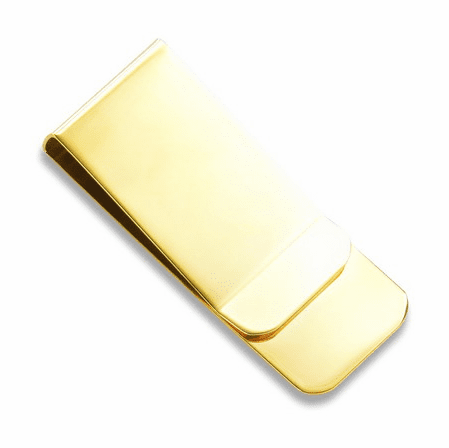 This classic polished gold tone French fold money clip holds up to 15 folded bills, and can be engraved on top for an added unique touch! Custom engraving is free, and we will package it in a gift box, creating the perfect gift for graduates, groomsmen, Father's Day, and birthdays! . Dimensions: 2 1/16" x 7/8" x 1/4"
i am buying two money clips how can i order for different name engraving for each one? 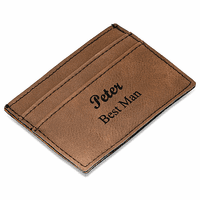 You'll need to add engraving for the first money clip by checking the Personalize It box above the Add To Cart button. Add the first money clip to the shopping cart and then press the keep shopping button. This will bring you back to the money clip page, so you can add the second one to the shopping cart before checking out. Before i clicked on your websiste, it says free engraving, i want to engrave some letters on a money clip, how dod i do that? Just check the Personalize box right above the Add To Cart button on the item page before adding the money clip to the shopping cart. This will open an engraving options window. I work with stainless steel jewelry so I expected nothing less quality wise when I purchased this stainless steel money clip. The color has already begun to fade after barely a week of owning it. I do love the engraving on it but the fact that it has already tarnished is off-putting. My jewelry doesn�€™t tarnish EVEN when I get it wet so their plating process must be really underwhelming. 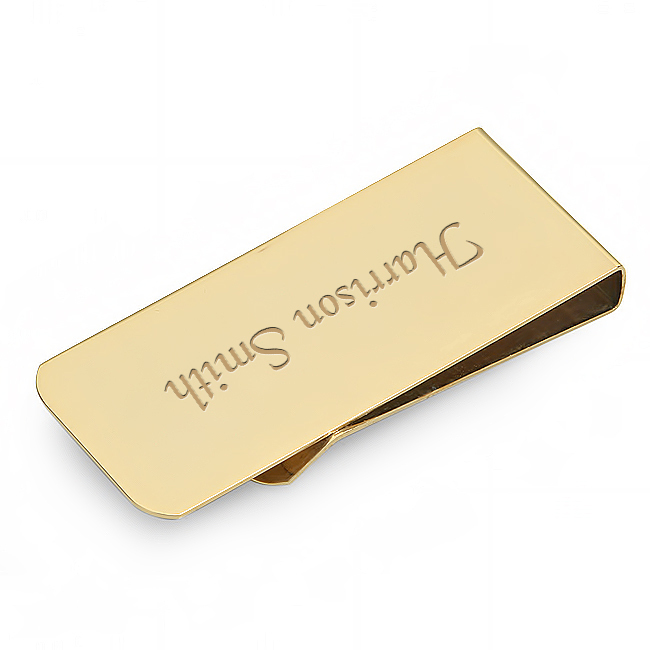 All in all, would not recommend if you want a long lasting gold plated money clip. My retired army sergeant loved this gift. It was exactly what I ordered. The message that I engraved was done very neatly. The actual clip itself was smaller than I expected, however, it was exactly what I was looking for. Very happy with how this turned out. Great gift for a man who is hard to buy for! I ordered it one day & the next day it was already engraved & shipped. Couldn�€™t ask for better service! Upon receipt of this item I was very disappointed with the overall quality. I had read reviews that there were "fingerprints" on others when they arrived, which wasn't a huge concern for me as I felt like I could buff off where it had been handled; however, the item I received was much less quality than that. The item arrived in a very flimsy cardboard box, absolutely not a gift box, and the money clip itself was extremely tarnished. There were a great deal of smudges / fingerprints, which could be removed, but the side/spine of the clip was tarnished to the point of being bronze and splotchy. Honestly, I'm not sure how someone allowed it through Quality Control. I contacted customer service who immediately expressed that they would have it shipped back out for arrival within 4 days. I requested if I could pay extra to have the clip delivered with 1 day shipping and explained that I needed it sooner as I had ordered the clip as a gift which was going to be taken on a trip. (Not only needed for the trip - I didn't want to have it sitting at my home unattended for 8+ days or returned to sender after not being able to pick up from USPS). Customer Service informed me that they would prioritize the shipment and assured me that it would be sent out that day and I would receive it prior to me leaving. Sadly, I have not received the package and was notified by USPS that I would receive the delivery after my departure. For the quality and experience with customer service I would suggest seeking another option. If you elect to use this company, I would make sure to plan in time for returns, re-shipments, and delayed deliveries. Understandably, Executive Gift Shoppe is not the manufacturer and cannot control the quality of the products, but they can surely control who they contract with as a provider of goods. Merchant Response:We're so sorry for the poor quality money clip you received. We have reached out to you via email about shipping a new one in the proper condition it should be in. Gold plate is already wearing off after two weeks. I guess for $24 it is ok. Get the stainless from another website for $6. Does the job. It's just the right size and gives the appearance of gold which puts me in the right mindset. The free engraving gave it that extra touch. It makes it look more fancy. I purchased this item to have as an extra since I use everyday a $3,000,00 18k gold money clip from Tiffany's . I realize this product is gold plated but within two days it became completely tarnished so I will no longer be using it .It looks horrible . Merchant Response:We're so sorry about that! Obviously, that should not happen. We'll be happy to ship a replacement free of charge. Could you contact us via this form: http://www.executivegiftshoppe.com/contactus.html with your order # and/or email so we can ship the replacement out? The item is very pretty & useful. The online experience selecting and buying the product was pretty easy and fast. However I felt a little misled with the shipping information. From the information on the website, it seemed like the order would ship very quickly, however that wasn't the case, and the email that was supposed to communicate that to me, didn't say it in a very clear way, instead it just looked like a repeat of the original order confirmation, so it was super easy to miss the detail on the items saying they would be shipped within 2-3 business days, instead of the advertised next day on the website. Additionally, it would seem like UPS ground would be a way better/faster option than the regular shipping, but now I'm not so sure about it. In the end I was very lucky, and even though the clips arrived later than I would be able to receive them by, a friend was able to get them for me and bring them to the event they were meant for. The money clips were ok, they seem to scratch kind of easily, and they are on the expensive side for what they are, but they work fine and everyone that got one was super happy about it. Overall it was an ok experience and I'm sure it would have been great if it wasn't because of the shipping miscommunication. Merchant Response:We're so sorry for any miscommunication. We had run out of stock on this particular money clip and we had to order it in. This was going to take two or three days as our wholesaler couldn't tell us for sure whether we'd have the money clips in two or three days. We did email you to let you know this but we are very sorry as we don't usually have shipping delays on orders. I purchased this for my dad. He loves it. He said it holds well, and looks nice. It's basic which was exactly what he wanted. Good buy. This is a very nice money clip. Excellent quality for the price. I love love love that the engraving is free! It is a little light but it is good quality. It had a few spots on it, but overall clean and came out nice. We ordered one of these clips for me and liked it so much that we ordered 2 more for each of my sons. Those clips had little blemishes in the metal which made them not suitable as gifts, although the engraving was very nice on all three. My wife called your customer service number and a couple of days later someone named Pete called back and said there was one box of clips with problems and that they would send new ones for my sons at no charge and that he would personally inspect them before shipping. Shortly thereafter we got the new clips which looked perfect and my sons are enjoying using them now. Excellent product for the money and even better customer service! 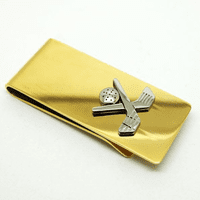 ProsWell polished gold colored clips, nice engraving, elegant little black gift boxes, very good value for the price, excellent customer service. I was thrilled ith the quality of the money clip I ordered for my son's graduation. The engraving was perfect. It was delivered on time. The price was almost as good as the quality. I highly recommend everyone to shop at your company for that special gift. Proseverything surassed what I expeced. Fast fast *FAST* delivery. Good last minute gift for a good price. But whenever you wipe the clip to keep it clean, the engraving gets kinda smudged. Be careful not to rub too hard. I don't know how you can sell, engrave, and ship for the cost. Great bargain! MONEY CLIP WAS SATISFACTORY. IT COULD BE MADE OF A LITTLE HEAVIER METAL. I THOUGHT SHIPING WAS A LITTLE HIGH.